The photographs here relate to Chapter 14 of The Complete History and were kindly sent by Wendy Walker and previously collected by Russell Stewart. They have assembled an extensive genealogy for the descendants of Samuel Jacka, father of William Jacka Snr. Russell is descended from Joseph Jacka (1838 – 1911), son of William Snr, through Joseph’s daughter, Mary Maria and her daughter with Albert Stevens, Ilene Annie. Wendy is descended from Mary Lilla Jane Jacka, daughter of William Jacka Jnr through Lilla's daughter Rose Florence. Elizabeth Jacka (1827 – 1914) was William Jnr’s older sister. Her relationships with three men, including marriages to John Giles and later, Henry Lewis, are described on pp. 249 – 252 of the book. The photo of a stoic-looking Elizabeth was taken in 1913 in Melbourne when she would have been aged 85 or 86 – about a year before her death. The second photo (below) is of the family of Elizabeth’s eldest daughter, Catherine Giles (1857 – 1923), the only child from Elizabeth’s marriage to miller, John Giles. This marriage was cut short by John’s death from tuberculosis. Catherine married Thomas Smith in Adelaide in 1879 and the family moved to Melbourne in about 1884. The photograph, taken in Melbourne about 1908, shows Catherine and Thomas with all their surviving children (familiar names and approximate ages in parentheses). Back: Robert (21), Thomas (27), James (Jim, 25), Henry (Harry, 23). Front: Elizabeth (Bessie, 12), Catherine (28), Thomas Smith (65), Catherine (61), Joseph (Joe, 14). The photograph on the right shows Joseph’s wife, Annie (Kent) (1845 – 1916) in Adelaide. It is not known when this was taken but may have been sometime in the 1880s or 90s. 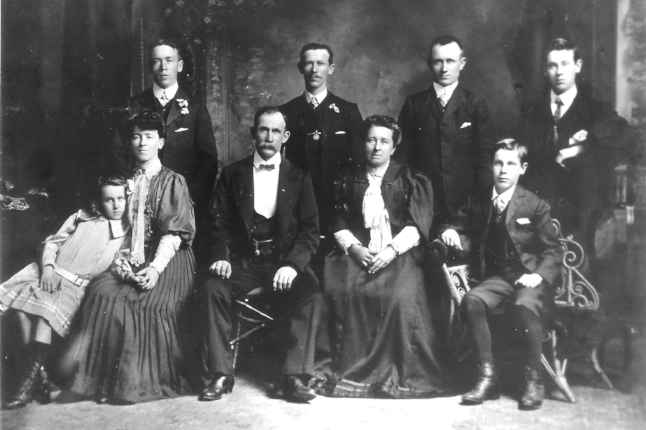 Back row: Ida May (Jacka) King holding Charles William King, Robert Arthur Kent Jacka, Rose Victoria Jacka, Samuel Hall Jacka, possibly holding son Clarence Samuel. Middle row: a daughter of Samuel Hall Jacka, Annie (Kent) holding Mavis Ida Jacka, daughter of Samuel, Lenard Roy Stevens, Mary Maria (Jacka) Stevens holding daughter Ilene Annie. Front row: another Samuel daughter, Stanley Albert Stevens, then two more grandchildren, possibly Edna May King and Evelyn Rose Jacka. The photo below, taken in Adelaide in late 1915 (possibly before son Robert Arthur departed for service in Egypt) shows Annie about a year before her death with some of her children and grandchildren. Joseph had died in 1911. The identity of some of the children is uncertain. Robert Arthur Kent Jacka enlisted (as Arthur Robert Jacka) in September 1915 at age 29. His service record shows that he was 5 ft 5in, 138 pounds, with dark complexion and hair and hazel eyes. He had been a blacksmith, labourer and station hand before enlisting. A private throughout the war, he was initially assigned to the Australian Imperial Forces 2nd Reinforcements 1st Remount Unit and sent to Egypt where he spent much of the war associated with the 2nd Light Horse as part of the Field Ambulance or on headquarters staff at the “Details” Camp, Moascar, east of Cairo. This camp, run by the Australian Army Medical Corp was a place for holding and training soldiers until they were sent back to the front. Robert Jacka was eventually invalided back to Australia in early 1919 with a diagnosis of “debility”, seemingly a catch-all term for weakness, fatigue and inability to perform duties. Robert, like many others, contracted venereal disease soon after arriving in Cairo in 1916 and was in and out of hospitals around Egypt for much of his four years there. So that may have contributed to his debility. He said he planned to assist his blacksmith brother after leaving the army. · An outline of Edwards Hicks Murray’s experiences as locomotive driver in Broken Hill. The documents above, with some further investigation plus review and discussion with Wendy Walker of various BDM certificates, make it possible to add significantly to details in The Complete History, pp.240-245, about Anna’s branch of the Jacka family. For this branch, the spellings of names and the ages given in various documents are somewhat fluid, possibly reflecting the fact that both Robert and Anna were illiterate, at least at the time of their marriage. Robert Murray was born around 1820-24 on the Isle of Man. This is based on (inconsistent) information in Birth Registrations for various children with Anna, as well as Robert’s stated age (32) when he married Anna. His first marriage, in early 1845, was to Ann Hicks, then about 19, in Liskeard, Cornwall. Ann had worked as a servant and was the daughter of Edward Hicks, a miner in St Blazey Parish. According to his obituary , Robert Jnr was born on September 17, 1845 and in 1847, he and his parents emigrated to South Australia on the British Sovereign, leaving London for Plymouth in April and reaching Port Adelaide in July 1847. Unfortunately the Murrays do not appear on the British Sovereign’s passenger list. However, Robert Jnr’s uncle, William Rundle, with whom they were said to be travelling , is on the list with a wife and child. William had married Ann Hicks’ sister Jane, in 1840. After arriving at the Port, the Murrays stayed with relatives, probably William Rundle’s father John and family at their Mt Barker farm . A second child, Edward, was registered as born in Adelaide on Aug 24 1847, a few weeks after the British Sovereign arrived. He survived until at least 1858 when he is mentioned on a birth registration and may be the Edward Murray who died in Victoria, aged 19, in 1865. Robert Snr was soon employed as a copper miner at the Kanmantoo Mines and then at Burra . Ann (Hicks) Murray died on June 8, 1849 at Burra  eleven days after giving birth to Ann Jane, the couple’s third child, who probably died soon after birth. Robert Snr was left with two young sons. In May 1852, he married Annis (Anna) Jacka who was already pregnant. At some point in 1852, the two Roberts, father and seven-year-old son, went to the Victorian goldfields  leaving Anna in Adelaide. Robert must have returned to Adelaide for the arrival of their first child since he was the informant (miner of Currie St) for the birth of Sophia in November 1852. William, their second child, was born in Bendigo (based on his death certificate) in 1854, probably in about May, based on ages given for him in birth registrations of later children. The Bendigo birth would suggest that by 1854, Anna with Edward from the first marriage and her own daughter, Sophia, had joined the Roberts, father and son, in Victoria. In October 1856, Henry the third child of Anna and Robert Murray was born at White Hill, near Bendigo. On the birth registration, Robert Snr was described as a miner. Close scrutiny of the birth and death registrations for children of Robert Snr and Anna has led to the conclusion that the Mary Ann and the David included in the family chart on p. 241 of The Complete History were not in fact, Murray children. The Murray family chart has been revised: see the end of this article. The informant for registration of Henry’s birth was Stephen Brown, “mate of the father”, also living at White Hill. This must surely be the husband of Anna’s sister Margaret. As noted in The Complete History pp. 245-9, after their marriage Margaret and Stephen Brown were on the Victorian goldfields from about 1852 to 1862. They were at Avoca in 1855 when their daughter, Mary Ann was born. She died as a baby in Jan 1856. Cause of death was said to be “teething” and in a sad note, the death registration indicated that there was no medical person in attendance because the family was “very poor”. Mary Ann’s death was at White Hill, so by early 1856 the Browns had moved from Avoca to the Bendigo diggings and the families of sisters Anna and Margaret must have been close. Both families may have been in the Bendigo area until about 1863. Robert Murray Jnr’s obituary mentions him seeing the Burke and Wills expedition setting out on their ill-fated attempt to travel from Melbourne to the Gulf of Carpentaria and back, potentially charting a route for an overland telegraph. The expedition passed near Bendigo, heading north, at the end of August 1860 and Robert Jnr may have been among those who rode out to visit the expedition . There was great interest in the lavishly-supplied expedition in Victoria. In fact, transporting extensive supplies (including a writing desk) slowed progress and doomed the expedition, in combination with heavy rain, the inexperienced leadership of Burke and bad luck . Robert Murray Jnr was in Melbourne  when the bones of Burke and Wills were returned to the city for burial in January 1863. It is estimated that 100,000 people watched the funeral procession on January 21 . On that same day, John McDouall Stuart returned to Adelaide having successfully crossed the continent from south to north and back at his third attempt. An experienced explorer, Stuart believed in travelling light. He identified a series of strategically-placed waterholes through the arid interior as the basis for subsequent construction of the overland telegraph . Anna delivered at least three more children after Henry while the Murray family was on the goldfields – Annes, born in 1858 who died of “atrophy” aged nine months in 1859, Annes born in 1859 who died of diarrhoea, aged 14 months, in 1861, and Benjamin, born in 1862. Robert Snr was described in their birth registrations as a miner, or in 1862, as a quartz miner consistent with working for mining companies which followed veins of gold-bearing quartz. It seems that around 1863-4, the family moved back to South Australia with Robert Jnr, and probably Snr too, working at Kanmantoo Mines . Although shut down from 1851 to 1856, the Kanmantoo mine was operating for most of the 1860s . Another daughter, the third given the name Annas, was born in the area, at Callington (according to her death certificate), before the family moved on to Moonta. After Robert Snr's early death in Moonta in 1879, most of Anna's family stayed in Moonta for some years. Robert Murray Jnr, a son from Robert Snr’s first marriage, continued in the mining business in Moonta until about 1876, when with his wife and four children, he moved to Mt Barker where for about 29 years he had a grocery business and bakery, and served for some years on the District Council [1, 3]. Anna and children Henry and Annas moved to Adelaide by 1885, when Annas married John Carclew there. As noted in The Complete History p. 244, Anna was living near her sister Eliza in Wright Street in 1888, as were son Henry and Annas and John Carclew . Benjamin moved to Broken Hill to work in the mines in 1887  and by 1890, Anna and most of her children other than William were there. There is an interesting story associated with Anna and Robert Snr’s last child, Edward (Ted) Hicks Murray, born in Moonta in 1867, after the death of the child of the same name from Robert’s first marriage. He probably moved to Broken Hill with Anna and some of her children in the 1880s. He worked for Silverton Tramway Co. for 25 years, working up from cleaner to locomotive engineer and then for another quarter century, drove trains for the Zinc Corporation . In 1915, Ted had a central role in events involving the only World War I shots fired in anger within Australia. On New Years day 1915, he was the driver of a 40-car train carrying 1200 people from Broken hill to Silverton for an Oddfellows picnic . As it rounded a bend two miles out of Broken Hill, the train passed a horse-drawn ice cream van flying a Turkish flag. Two turbaned men emerged with rifles and fired first at Ted and his fireman in the locomotive, then 20-30 more shots as the train passed. Fearing panic amongst his passengers, Ted hastened to get the train out of range before stopping to assess injuries. Help was sought for the dead and injured before Ted backed-up the train to Broken Hill . Meanwhile the Turks retreated to a rocky hill west of town, with a detachment of police and gun-carrying citizens in pursuit. It was reported that among the pursuers, “there was a desperate determination to leave no work for the hangman”. After a short battle, both Turks were mortally wounded. In the whole exchange, four were killed in addition to the Turks, and seven injured. One of the Turks was around 60, a butcher and camel-driver who had lived in Broken Hill for 18 years. The other was an ice cream vendor [12 ,14]. That night, after the war had come to Broken Hill with tragic results, several thousand men, singing patriotic airs and hurrah-ing lustily, marched to the German Club and set fire to the building .